BAD KITTY! 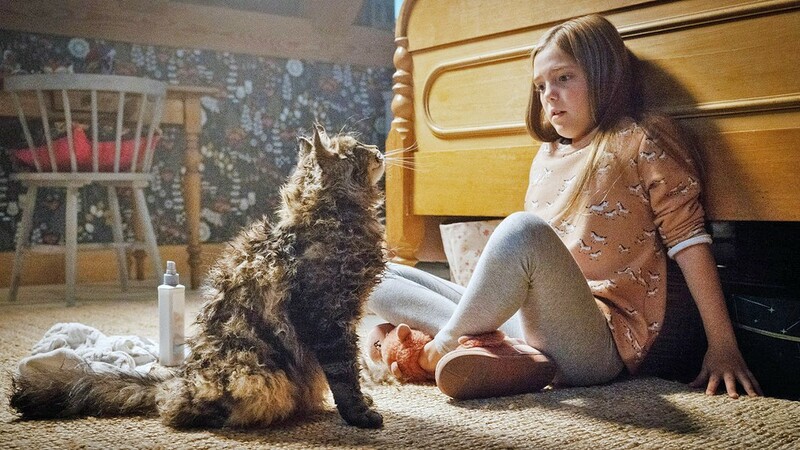 Ellie (Jeté Lawrence) discovers that her cat, which went missing for a day, is decidedly more hostile upon his return. Glen I sure wish movies could still scare me. I remember being freaked out as a kid, my imagination run amok, but I don't believe in the occult, so these days, horror movies never horrify me. That said, there are some creepy moments in this second adaptation of King's Pet Sematary, a few good jump scares, and some good acting and directing. But as far as delivering real chills, nope. Nada. The whole point of the story is the mystery of what lies beyond this mortal coil. Rachel, whose sister died young, wants to shield her daughter, Ellie (Jeté Lawrence), from the thought of death and talks about heaven, but Louis thinks making up stories about an afterlife is wrong and states matter-of-factly that nothing exists after death. When Ellie's cat, Church, is hit by a truck, their neighbor, Jud (John Lithgow), helps Louis bury the animal in a special plot of land, and the next day Church magically reappears. He's a bit tattered, worse for wear, and more importantly, he does not act like the same cat. But Jud and Louis think they've saved Ellie from the pain of death. If you know anything about King, you know it's just a matter of time before someone precious dies, and someone has the bright idea to plant that someone in the resurrecting ground. "They don't come back the same," Jud ominously intones. He's right. Unfortunately, raising the dead isn't as exciting or scary as it sounds. The film's watchable but not exceptionally so, and many viewers will know the story from either the book or the 1989 film of the same name—for which King wrote the screenplay, so it's predictable. For their part, directors Kölsch and Widmyer and writers Matt Greenberg and Jeff Buhler mix up the story a bit, so even if you know King's tale, there are a few surprises to be had. But fundamentally it's the same idea: We don't know what lies beyond life, and we probably shouldn't know! Anna "Sometimes dead is better" is another of Jud's ominous warnings, and Louis would have done well to heed his words, but what kind of story would that be? Things have to get down and dirty in the King universe, and even his "happy" endings leave a wake of death and destruction. I recently re-read the book in anticipation of the film (OK, full disclosure—I listened to the audiobook. Michael C. Hall narrates, and it's a fantastic way to ingest this bone-chilling tale), and while there are myriad changes to the details, the essence remains the same. Of course, the audiobook was more than 15 hours, while the film clocks in at a little more than an hour and a half—let's just say a lot of the minutiae gets tossed aside. Even if you aren't a self-proclaimed "fan" of King's work, it's hard to argue that the man doesn't know how to weave a story like the back of his hand. While this is certainly his tale, I had to make the choice to separate the two works about a quarter of the way into the movie. Otherwise, I was going to sit and stew over why the filmmakers made certain choices and changes to the original storyline. That said, on its own, the film still suffered from predictability, and it also didn't strike me as especially frightening or horrific. There were a few jump scares here and there, but mostly just dread of the inevitable doom enshrouding the Creed family like a fog. 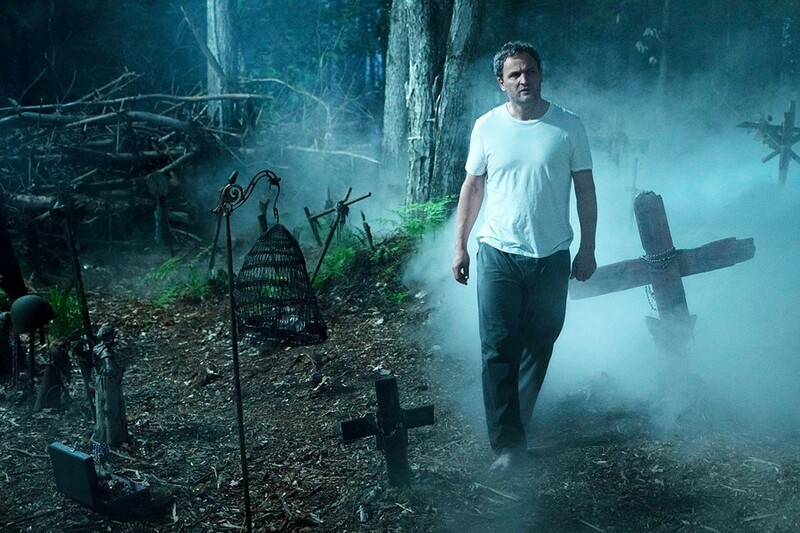 WHAT LIES BEYOND Louis (Jason Clarke) doesn't believe in an afterlife but soon finds out his beliefs are irrelevant to the strange goings on in the woods behind his new home. Glen They did seem sort of cursed, didn't they? Louis, a former emergency room doctor who has taken a job as a college physician, is soon haunted by a college student who was hit by a car, and who Louis couldn't save. Rachel is haunted by her sister. Their sprawling new property is haunted by a weird burial ground. Their poor kids are in for a real terror ride. Gage (Hugo Lavoie) is too young to know what's going on, but Ellie definitely wants to go back to Boston. Lawrence is really good in the role. She looks like a young Sissy Spacek, and the script gives her a lot to do, especially in the film's final third. Clarke as Louis is also good—he's a man being forced to confront his entrenched beliefs, a rational man who discovers his world is no longer rational. This new adaptation is certainly better than a lot of recent horror films, but it's nowhere near as good as some inventive new entries into the genre, such as Overlord (2018), A Quiet Place (2018), Hereditary (2018), It Comes at Night (2017), 10 Cloverfield Lane (2017), Get Out (2017), or Us (2019). If you love King or you love horror, spring for a matinee, but I'd be happier paying the rental price.